We here at Ross Motor Company want you to find a vehicle that your entire family can enjoy. That's why we're excited to introduce you to the 2018 Dodge Grand Caravan. 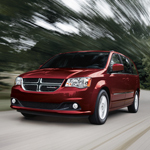 This popular family minivan is available with optional upgrades that can keep everyone in the cabin entertained. The available Single DVD Entertainment System is perfect for long road trips. A flip-down screen is installed onto the roof of the cabin. Your rear passengers can watch movies to pass the time. The driver and front passenger won't have to worry about the noise. The system acts independently from the front infotainment center. It also comes with wireless headphones so that everyone stays happy. We invite you to visit our showroom today to take the 2018 Dodge Grand Caravan out for a test drive. We'll walk you through your options and help you find a model that works for your family's needs.